Victoria H. Smith: Oh, How I Miss You Blogfest! Hey, friends! 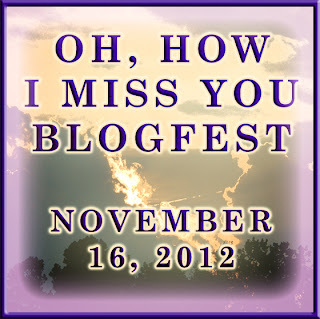 Today is the Oh, How I Miss You Blogfest hosted by Andrew Leon, Matthew MacNish, and Alex J. Cavanaugh! I found this blogfest on Alex's blog, and knew I had to participate. What we are supposed to do for this blogfest is list one to three blogs that we love, but haven't seen blogging very much lately. Then we are supposed to post one to three blogs that we would miss very much if they stopped blogging. Well, once I saw that, I just knew who I wanted to feature! When I started my blog, I started as both a book blogger and a writer, so I had a dual-type blog, if you will. There are two bloggers who I don't see posting very much recently that I followed as a book blogger and a writer. I absolutely love this girl, and love this blog! We both started our blogs around the same time last year and became quick friends. She has awesome recommendations for books, and a super cute blog. She hasn't been posting as much lately, and I'd love to see her back. Love your blog, Shawna! Aubree also started her blog around the same time I did last year. She has a great writing blog with awesome tips for fellow writers. Haven't seen her around much lately and would love to have her back! So, onto the bloggers I would miss very much if they didn't blog very much. Words cannot express how much I would miss Carrie if she didn't blog anymore. Not only is she my NA Sister from NA Alley, but she's a good friend. She posts every Monday on her blog, and has great tips and fun content for writers. Carrie, don't you dare go anywhere, or I will be super mad at you! Jade, Jade, Jade... LOVE this girl! Not only does she have a killer name, but her stellar book, Ocean Kills, is coming out soon, and I just can't wait. Her awesome blog has me clicking away the instant I see a new post from her in my feed. Check this girl out. You won't regret it! So those are the bloggers I miss and would be missed if they didn't blog so much. Thanks for hosting this blogfest Andrew, Matthew, and Alex! Oh, Victoria... *sniffles* I will never leave you! Thank you for the shout-out, my friend! :D I hope you're enjoying Release Week! I'm certain all who you mentioned are touched. Carrie definitely is. I found you from the blogfest. Thanks for sharing and introducing me to some new bloggers. Some very good choices in your list Victoria! We'd miss Carrie and Jade as well! Hey, I know some of these bloggers! Love these ladies. I would miss Carrie, too, but I bug her so much via text, That's not likely to ever happen. Straight over from Alex's - nice to meet you! Some great recommendations you have! I really miss The Writing Hour. Aubree's posts were always great to read . . . I must agree! Carrie is a SWEETHEART! They sound like awesome bloggers...maybe they will see this and come back!